Editor's note: On July 10 in New York City, The Root was honored with the opportunity to sit down with Ghana's then-Vice President John Dramani Mahama, who was doing a book tour for his new memoir, My First Coup d'Etat: And Other True Stories From the Lost Decades of Africa. Mahama had written for The Root in the past, and we looked forward to an open and wide-ranging conversation about the lessons he has learned about Ghana's past and future. During it, he touched on Africa's "lost decades," his hope for the region's future and the role of Chinese investment in that future. 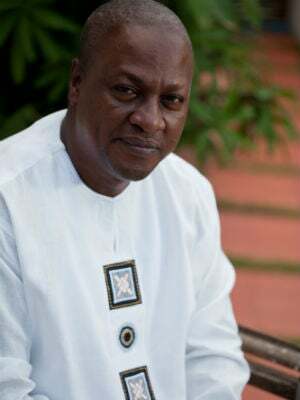 As the Republic of Ghana mourns the death of President John Atta Mills, we extend our condolences and share with you a glimpse of the African nation's interim president, to be sworn in Tuesday evening, John Dramani Mahama. (The Root) — When John Dramani Mahama, who until July 24 was the vice president of the Republic of Ghana, was in class three at an elite boarding school in the late 1960s, he experienced an unforgettable encounter with a bully named Ezra. After slyly gaining the trust of his peers, Ezra, muscular and bold for his age, managed to create a system that required all students in the school to donate their mid-afternoon snacks to his private food collection, one that he would dive into after-hours without sharing. Ezra instilled so much fear in his classmates that no matter how unfair it was, everyone obliged. Eventually, young Mahama grew tired of the snack confiscation system. He and his friends set out to plan a peaceful revolt. They would scarf down their snacks just before the time came to turn them over to Ezra. They would deliver a thoughtful speech — something about how their fathers pay their school fees, and thus, pay for their snacks. They would stand up for themselves and await the consequences. Out of fear, his two friends dropped out at the last minute. Still, Mahama didn't waver in his plan to defect. He ate his cake. "Ezra released his punishment in one fell swoop. I barely felt the blow, but it landed me on the floor," he wrote in a chapter of his new memoir, My First Coup d'Etat: And Other True Stories From the Lost Decades of Africa. "He kneed me; he gave me knocks on my head. He really maltreated me, but I did not die. I did not die." It was his experience with Ezra that Mahama called a true "microcosm of what was happening all throughout Africa." From the late 1960s until the 1980s, just after Africa freed itself from the grip of European colonialism, dictators sprouted up as often as new national flags. War and poverty ravished the continent. "Additionally, because of the economy, hardships and the brain drain of that time, the period wasn't documented properly," he told The Root about his reasons for chronicling this time period in his book. In his debut memoir, Mahama is part novelist, part historian and part ethnographer, weaving his life's story with the history of Africa's first independent country. Mahama spoke to The Root about those "lost decades," why Chinese investment in Ghana is critical for this period of history, or what he casually called the "found decades," and why countries in North Africa can learn from their sub-Saharan neighbors. The Root: What is so urgent about touching on what you coined the "lost decades"? What insights can we glean from that time in history that would apply today? John Dramani Mahama: A lot of people who have written about Africa write about the precolonial struggle for independence, or postcolonial period. [But the "lost decades"] was the period that set the stage and created a platform for the progress that we're seeing today. We learned from experiences of the coups d'état, from the droughts and from the brutality of the era. So [now] there is a strong sense of protecting human rights in Africa today. A strong sense of [the value] of a constitutional government. A strong sense of rule of law. So the era was a catalyst for the improvements we're seeing today. TR: You write about Ezra, a school bully from your childhood, and how your experience with him served as a microcosm of what was happening around Ghana. How have you resisted other Ezras and bullies in your career? JDM: At the time, there were really horrible dictators ruling in Africa. I used Ezra's story to show that in our own little ways, by defying and resisting such bullies, we could create a better society for our people. And that is what began to happen in Africa. Ordinary people — who were normally powerless, helpless and unarmed — resisted. Uganda's Idi Amin died in exile. Democratic Republic of Congo's Mobutu Sese Seko had to run and died in exile. People rose up and found their voices again. And when people come together and speak up as a collective, there is nothing that can stop the power of the people. Everybody who has read that story has identified their own bullies in their lives. Everyone has an Ezra in their life, but one must be able to build up courage and say, enough is enough, I won't take this anymore. TR: Resistance seems to be a major theme in your book. If we consider what has happened in North Africa over the last year, what do you think the role of resistance will be in sub-Saharan Africa in the coming years? JDM: Sub-Saharan Africa has made that transition already. People look at the Arab Spring and ask when is it going to happen in sub-Saharan Africa, but it's happened already. Sub-Saharan Africa has transitioned to democracy, to elections and to good governance as a rule of law. So I think a more accurate question would be what influence has sub-Saharan Africa had on the Arab world? TR: If it's not resistance from a political standpoint, are there any social issues that might stir up some resistance? Perhaps with gay, women's or children's rights? TR: In your book, you touch on how passionate you are about class struggle, and you've long been touted as a champion of the underdog. How does Ghana's expanding relationship with China aid you in that cause? JDM: Ghana has received phenomenal assistance from China. Currently, we are processing a loan of $3 billion for strategic investments in key sectors of the economy. For instance, we are expanding the ports in order to accommodate the traffic that is a result of the new oil and gas industry that is growing in the Western region. We are financing the construction of a power plant for power generation. We are building marine-landing sites all along the coast to improve conditions for fishermen. All of this was made possible by Chinese investment. The money is being invested strategically in the way that not only accelerates the growth of the economy, but also creates jobs to accommodate the teeming of our young people that are just coming out of school at different levels of the educational chain. So especially in terms of creating jobs for people, especially for the youth, it's a good thing. TR: What would you say to African Americans who might be concerned about Chinese investment in Africa? JDM: [I would say Chinese investment] is necessary. Because of the global financial crisis, our traditional partners have been worse. Naturally, we have a relationship with Europe because of our colonial relationship. But because of the financial crisis in the developed countries, the kind of assistance that African countries need to accelerate their economies, they are finding it difficult to get it from the West. If anything at all, you'll get it in dribs and drabs, and that is not sufficient enough for the kind of investment we need. And we're turning not only toward China, but to all the emerging economies. Brazil is one. India is one. Even Russia is one. It's a matter of necessity. I mean, we need $3 billion for infrastructure development and we just can't get it from the West. So you turn to where you can get it. The important thing is proper negotiation with whoever is investing, whether it's China or America. And certainly I don't look at the color or nationality of who gives us assistance. The issue is that we need that investment and you must negotiate that investment properly. So that's what we've done. As long as you're using the assistance productively, then you can use that revenue to pay back the loan over a period. TR: If the 1960s to the 1980s are the "lost decades," then what would you call this period? JDM: The "found decades." Ha. Africans are more conscious now. They are willing to speak up. There is a strong civil society. So if you juxtapose these two periods, then we have definitely found our way. Akoto Ofori-Atta is The Root's assistant editor and is Ghanaian American. Follow her on Twitter. What Would Fela Think of Today's Africa?